This spicy southern dish is a great crowd pleaser – If you have a house full this is a great stress free way to feed them. 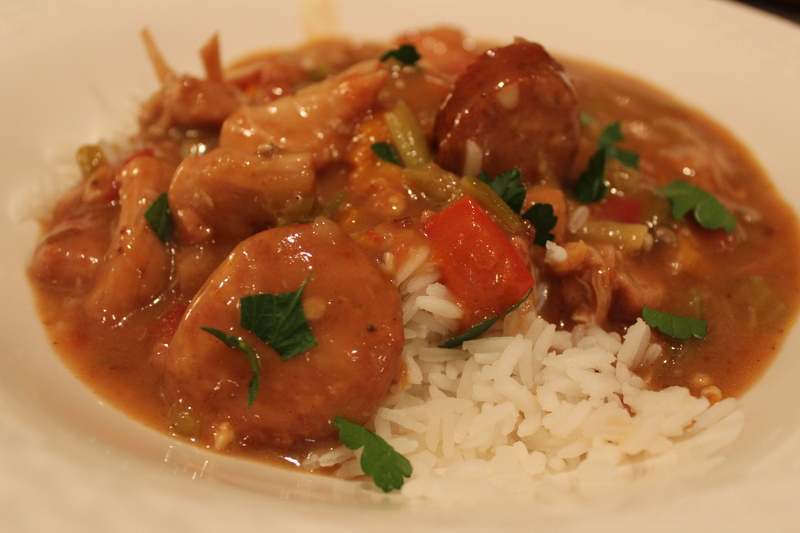 Reheat the gumbo slowly on the stove and make a big batch of Jasmine rice – I served it with plenty of crusty bread and a simple green salad. The Andouille sausage can pack a lot of heat so I held the hot sauce for individual preference. Cut the chicken thighs into 8 pieces each and toss with the salt mixture. In a large heavy stock pot heat the oil. Brown the chicken in batches and transfer to a platter. In the same oil, brown the sausage in batches and transfer to the platter. Pour off all of the oil/drippings to a heat proof container and reserve. Put the stock pot back on the heat and add about 2 cups of the chicken stock and deglaze the pot scraping all the fond from the bottom of the pot. Pour into another heat proof container and reserve. Add oil if necessary to the reserved oil/drippings to make 1 cup and pour back into the empty stock pot and add the flour. Whisk constantly until the roux starts to thicken and turns the color of chocolate milk about 15 minutes. Add the onions, celery and peppers and stir. Add the chicken stock, the reserved stock/fond and tomatoes. Add the chicken and the sausage and any accumulated juices from the pan. Simmer for 45 minutes on medium low. Add the okra and simmer for another 30 minutes. Remove from the heat and add the Worchester sauce, lemon and honey. Skim the fat from the surface before reheating for serving. This entry was posted in Recipes and tagged Andouille Sausage, chicken, gumbo, Make ahead, okra, Sausage, Smoked Paprika, soup. Bookmark the permalink.